Lizzy Yarnold carried Great Britain's flag, while Russian athletes came in under the neutral Olympic flag. Russia is banned from the Games, and the forthcoming Paralympics, as a consequence of the 2016 McLaren report which claimed more than 1,000 of the country's sportspeople benefitted from state-sponsored doping. The International Olympic Committee invited 169 Russians who have met the anti-doping criteria to compete as independent athletes and their team will be known as the 'Olympic Athletes from Russia'. Senior political figures from North Korea and USA - two of the countries at the centre of the political row - were both present. Kim Yo-jong, the influential sister of North Korea leader Kim Jong-un, was sat one row behind USA vice-president Mike Pence in the VIP section. South Korea's president Moon Jae-in said in the build-up: "I would like to take this opportunity to convey greetings and a message of friendship from the people of Korea. "The Seoul 1988 Summer Games paved the way for reconciliation between east and west - breaking down the wall of the Cold War. 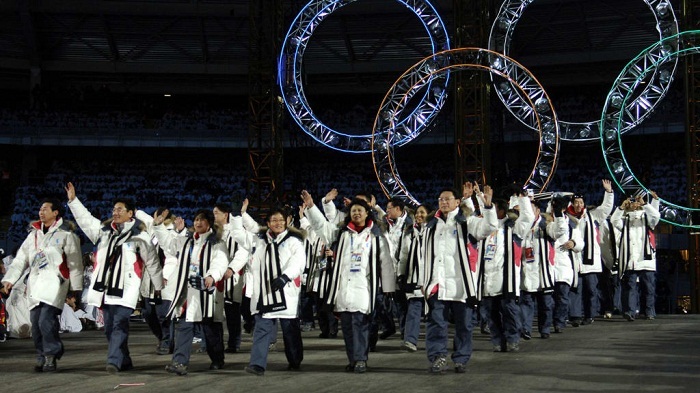 Thirty years after hosting the Summer Games, the Pyeongchang Olympics has commenced with a hope for peace from everyone around the world. "It was with an ardent desire that the people of Korea aspired to host the Winter Games, the only divided nation in the world. It mirrors the Olympic spirit in its pursuit of peace." The team consists of 22 athletes who will compete in five sports, although their women's ice hockey players will compete in a unified Korean team. They played together for the first time last Sunday in their only practice match, which they lost 3-1 to Sweden. The 'wow moments' in the ceremony included the formation of the Olympic Rings made up of 1,218 drones - a Guinness World Record for drones used in a performance - and 100 skiers. There was also 'the vision of peace in the sky' which was a constellation inside the arena, while 'the balance of yin and yang' saw Korean drummers perform in unison before forming the South Korea flag. And the centre of the stadium was lit up in the eye-catching 'link to the world' segment. During the parade of athletes, Tonga's flagbearer, cross-country skier Pita Taufatofua, came out into the arena without wearing a top, despite sub-zero temperatures. He wore similar attire during the opening ceremony at Rio 2016, when he competed in taekwondo. Bermuda's contingent wore shorts during the parade in Pyeongchang. There was also a performance of John Lennon's Imagine, which included the formation of a giant dove of peace. It all culminated in the ceremony centrepiece, which was the traditional lighting of the Olympic flame. That saw the final torchbearer Yuna Kim, who won Olympic ice skating gold in 2010, at the top of a slope light the flame as 30 fire rings ascended towards the white moon-shaped porcelain cauldron. The 18 days of competition will feature 2,925 athletes competing in 15 sports under 93 flags chasing 102 gold medals. Six countries are participating in the Winter Games for the first time: Ecuador, Eritrea, Kosovo, Malaysia, Nigeria and Singapore. Great Britain's team consists of 58 competitors, with short track speed skater Elise Christie and freestyle skiers James Woods and Izzy Atkin all in with good chances of picking up medals. Another medal prospect, snowboarder Katie Ormerod, was ruled out after suffering a broken heel and wrist after crashing twice in slopestyle practice. UK Sport has set a target of at least five medals from the 2018 Games.